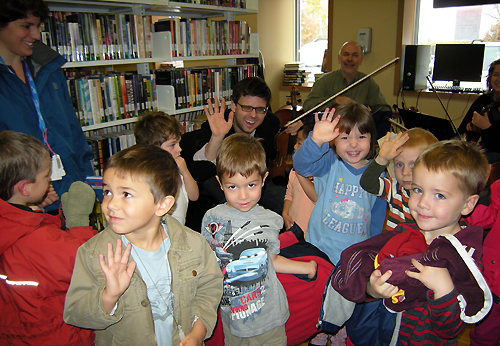 In partnership with the Greater Sudbury Public Library, the SSO presents a unique series of free programs that combine pictures, storytelling and live music. These engaging presentations take place during storytimes at various public library branches and encourage literacy, imagination and a love of music. The Sudbury Symphony Orchestra has partnered with Sudbury Youth Rocks and the Big Brothers Big Sisters of Sudbury to provide an affordable classical music experience to young people who may not otherwise have the opportunity to experience a live concert. Through increased musical experiences, and the opportunity to watch professional musicians on stage, these young performers have the ability to increase their skills and musical experiences. Please contact us directly if your organization is interested in participating in the SSO Share the Music Program. The Sudbury Symphony Orchestra presents random acts of music throughout the City of Greater Sudbury. Through spontaneous performances, the SSO makes this city a more musical place to be: listen carefully, as you never know where a performance will pop up!